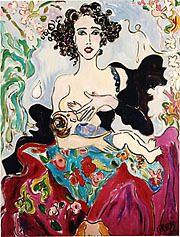 The song , “It’s a long, long time from May to December”, chronicles the stages of love, womanhood and relationships. In retrospect the “Malus Maypole’s” journey to my rooftop garden started before May, but in considering the purchase of this particular tree, who could have imagined just how giving this apple tree would be from May to December? The journey of this apple to my garden started on a winter’s trip to Barcelona when love had grown worn and threadbare. I had hoped that a trip to this city of architecture and food would reweave love with ever more colorful threads. As we walked the streets of the city, gazing at the unique vocabulary of the buildings, ever the optimist and try as I might, no invisible mending was taking place. As is my want, I consoled and filled my soul with beauty and inspiration from the cityscape. Barcelona residences generally have no front or backyards. The secret to their outdoor space is hidden by fanciful decorative parapets seen from the street. Those fantastic shapes and urns, seen from the front, provide privacy and form the balustrades of roof top yards and gardens. Several years ago, I had created a courtyard garden at 124 Merton Street. The courtyard was in existence already but was placed in a sort of pit in the second floor of a five story building. You could see the sky but the sun rarely shone there. It had all the charm of a prison exercise yard. I built four huge central planters and filled them with tall Service berry trees, a species that would thrive in the shade, bloom and provide fruit. Other boxes were filled with fragrant herbs as well as parsley, celery, ivy geraniums, and climbing hydrangea. I affixed trellis work next to the windows facing the courtyard from the second to the fifth floor, repainted the windows to harmonise with the planters and bought eclectic garden furniture from the 1950′s until the present. When I had finished Angie, who had built all the boxes, gardened and painted asked me,”When are we renting out this space for weddings?” A previously cold ugly and unappealing space had become a charming and lovely space to congregate, so much so it could be a space not only for relaxing and eating lunch, but a place for celebrations. It was beautiful but I was not entirely satisfied. Gazing upwards, to I longed to build a parapet that would add architectural detail to the dull roof line. The idea became reality when the building was chosen to be on “Doors Open Toronto”. Knowing that hundreds of people would come to enjoy the “boutique” office building, the framed textiles lining the hallways and our gardens, I had to build more railings for the rooftop garden. 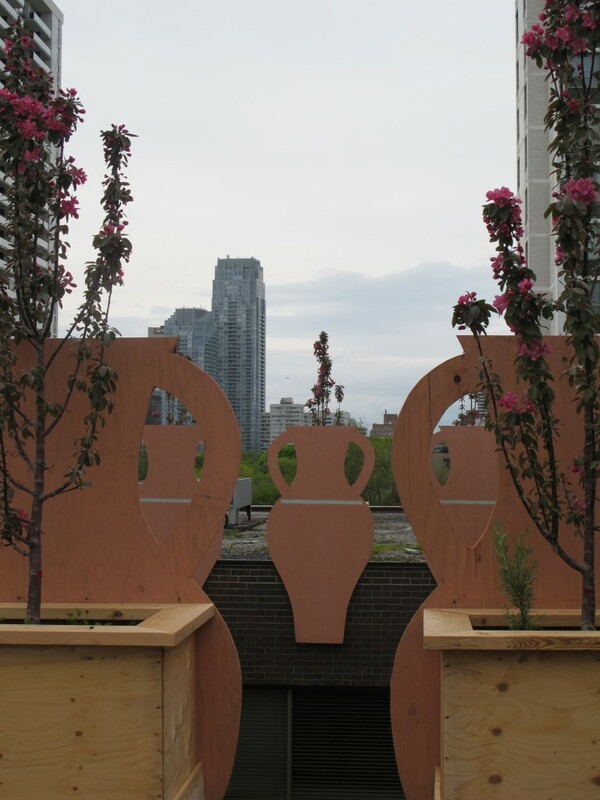 I cut six giant urns out of plywood, a post modern touch for the skyline of the courtyard, and built heavy planters on the roof garden side to to secure them. 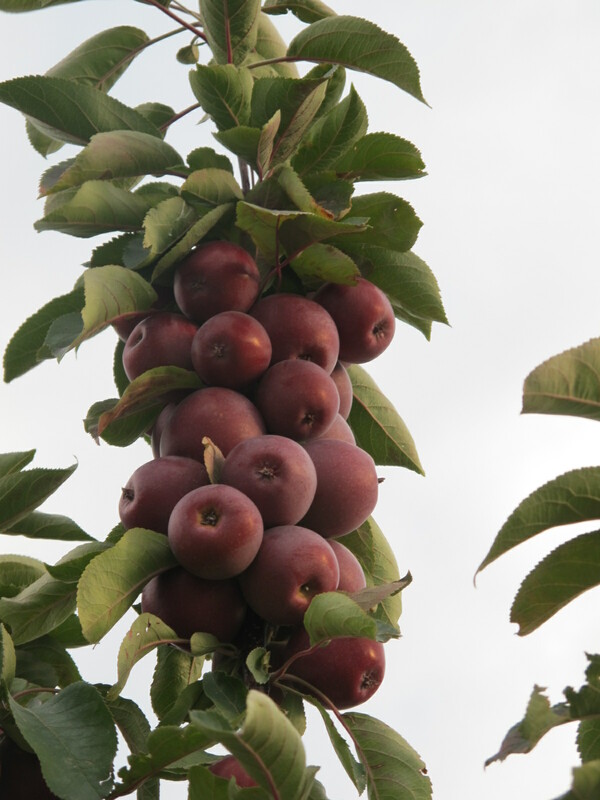 After research, I decided to plant them with “Maypole Apples”. In order to keep the look from the downstairs, I needed a tree that would grow in a columnar shape and from the roof garden side a tree that would grow well in planters and be able to withstand the sometimes brutal conditions of gardening on a roof. 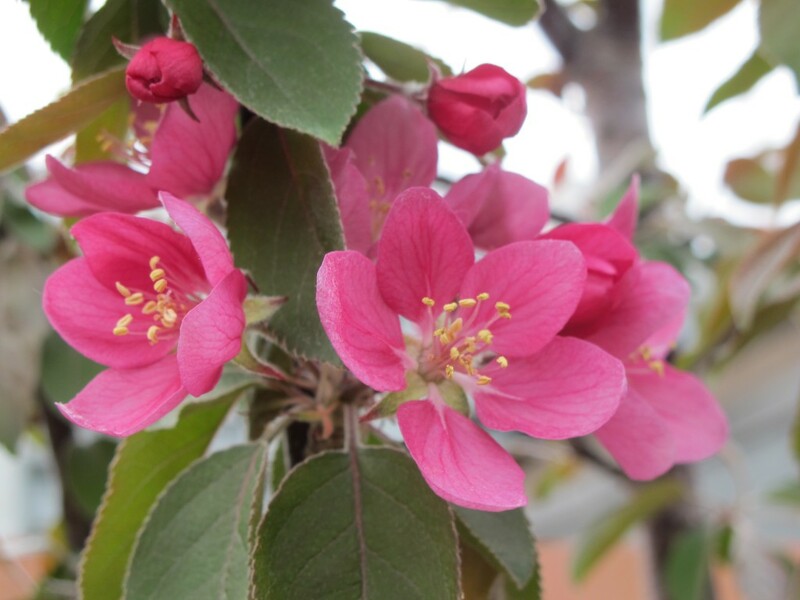 The cerise blossoms in May filled my heart with a girlish, joyful innocence that I thought I had lost forever. As the summer progressed, the apples ripened with an unexpected abundance. As Summer waned and Fall was on the horizon, I gathered basketful’s. These apples appeared at every celebration. 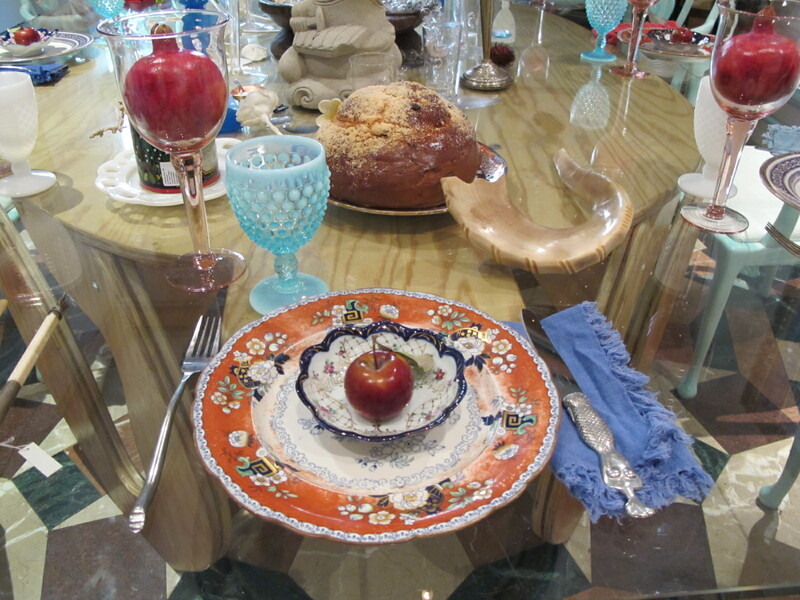 For the Jewish New Year, just as the apples were at their crunchy, sweet tart apex I served them whole, one per person, instead of in the traditional slices. 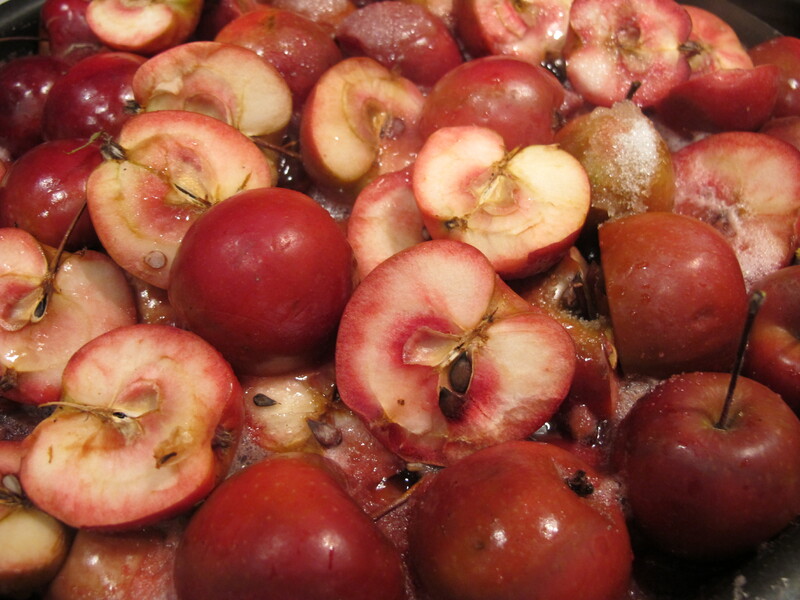 For Simchas Torah, I cooked them whole with sugar and licorice flag from the garden to give the apples a complimentary anise flavor. Sukkot, they were sliced in a mandolin, revealing their rosy flesh, and lined on lettuce leaves for a salad. Canadian Thanksgiving they were pickled whole with rosemary that had grown beneath the apples in the planters. For American Thanksgiving, I cooked them into a “faux” cranberry sauce with chocolate mint from the rooftop garden. No one missed the traditional turkey accompaniment. As the days grew shorter in December, I realized that my heart was healing. The apples had grown soft, not being of a “keeper” variety. I realized I no longer dreaded the long dark nights and prepared to celebrate the light of the candles with family and friends on Chanukah. 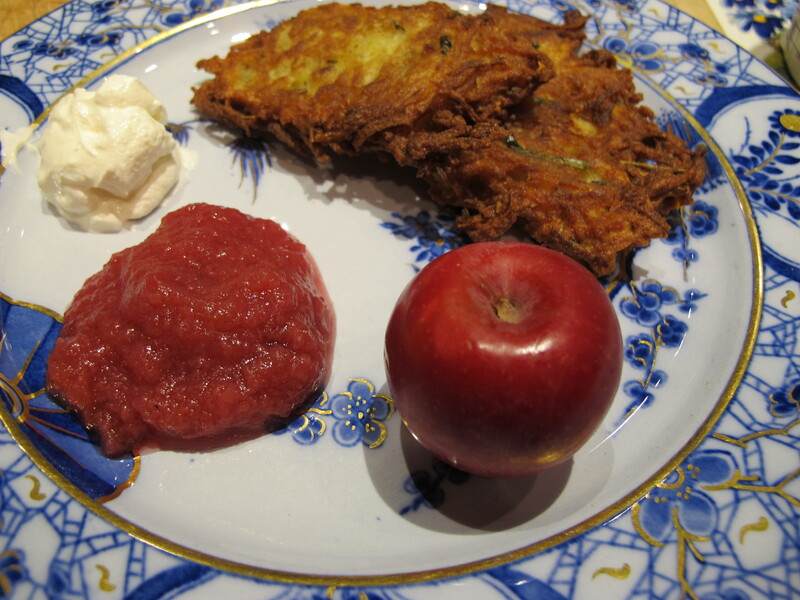 The apples that had already celebrated many festivals were made into sauce and served with latkes. The apples for now are a tender romantic memory until they burst into bloom next May. Drain the potatoes. Normally one does not associate potatoes with being watery but grating them reveals more cut surface and the inner juices flow. Mix all the ingredients thoroughly in a bowl adding lots of freshly ground pepper and salt to taste. If you are averse to tasting raw potatoes and eggs, sea salt can be sprinkled on the fried latkes to a taste advantage. Heat plenty of canola oil in a pan until hot. The secret of not filling your house with the scent of heavy oil is paradoxically to use plenty of oil when frying. Scoop the potato mixture in proportion to the size of pancake you wish to serve into the hot oil. Fry until golden, turning once so each side gets cooked. Serve immediatelywith sour cream and applesauce. This entry was posted in art, decor, food, gardens, recipes, travel, urban farming and tagged 124 Merton Street, American Thanksgiving, apple sauce, Barcelona, Canadian Thanksgiving, canola oil, chocolate mint, Doors Open, Doors Open Toronto, hot oil, latkes, love, malus maypole, Maypole Apple, parapet, rooftop garden, service berry, Simchas Torah, streetscape, Sukkot. Bookmark the permalink. silvia on Aujourd’hui “Christina” est arrivee en France! not far from the tree » Blog Archive » We all do what it takes to find sweetness… on We all do what is takes to find sweetness: Maple; tap into it!